San Francisco is the perfect spot to look for a charming boutique hotel - the character of the city is crying out for some flair and originality in your choice of hotel. Just make sure you are central, to enjoy all the city has to offer. The Orchard Garden Hotel - right in the heart of the city is the new eco-friendly Orchard Garden hotel. With bright, newly designed rooms, energy saving design and recycling throughout, Orchard garden is easy on the pocket and the eco credentials enhance the hotel for the guests as well as for the environment. 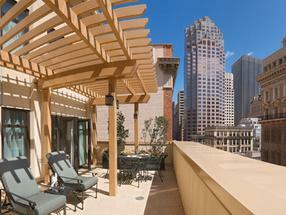 Design Hotels in San Francisco - from Hotique. Romantic rendezvous, Honeymoon or a sleek city break? Small & hip hotel or 5 star luxury? Find your perfect hip hotel in San Francisco.